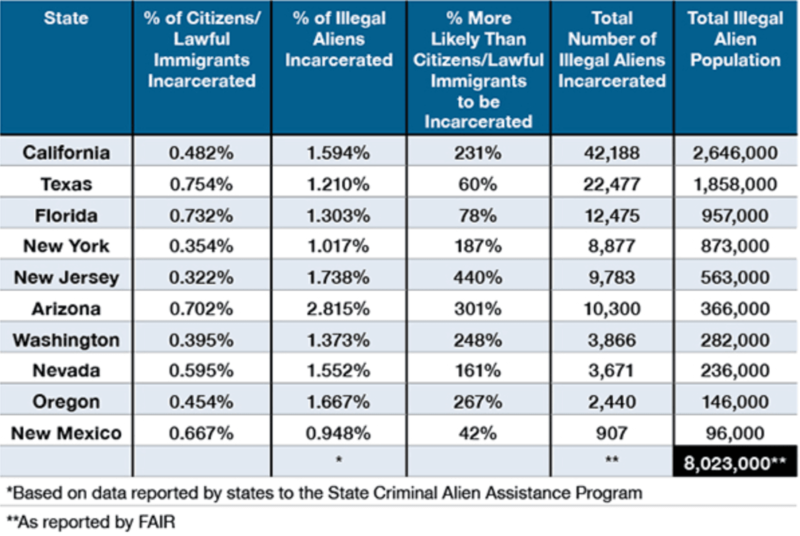 The number of illegal aliens in prison approaches nearly three percent of the state’s entire illegal population, while less than one percent of Americans and legal immigrants are incarcerated as a share of the citizen and legal population. In California — the state with close to three million illegal aliens — illegal aliens are more than 230 percent more likely to be in prison than Americans and legal immigrants. In New York — with an illegal population of about 873,000 — illegal aliens are nearly 200 percent more likely to be incarcerated than American citizens and legal immigrants. 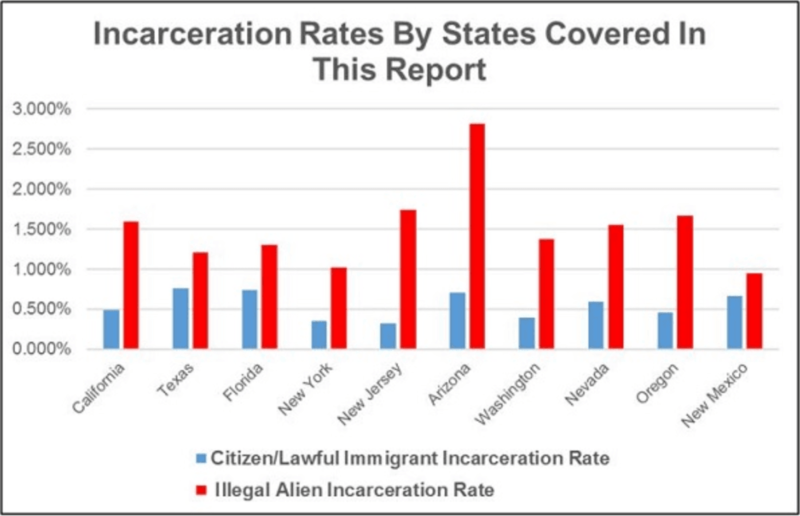 New Jersey, Arizona, and Oregon outpace all other states when it comes to the percentage of illegal aliens who are more likely to be incarcerated than the citizen and legal population. For instance, in New Jersey, illegal aliens are 440 percent more likely to be in prison than Americans and legal immigrants. In Arizona, illegal aliens are more than 300 percent more likely to be incarcerated, and in Oregon, they are 267 percent more likely to be in prison. Every year the U.S. admits more than 1.5 million immigrants, with the vast majority deriving from family-based chain migration, whereby newly naturalized citizens can bring an unlimited number of foreign relatives to the U.S. In 2016, the legal and illegal immigrant population reached a record high of 44.5 million. By 2023, the Center for Immigration Studies estimates that the legal and illegal immigrant population of the U.S. will make up nearly 15 percent of the entire U.S. population.